WEST LAFAYETTE, Ind. - Sanitizing the outside of produce may not be enough to remove harmful food pathogens, according to a Purdue University study that demonstrated that Salmonella and E. coli can live inside plant tissues. "The pathogens were in every major tissue, including the tissue that transports nutrients in plants," said Deering, whose results were published in separate papers in the Journal of Food Protection and Food Research International. Deering and Robert Pruitt, a professor of botany and plant pathology, said finding pathogens inside plants has been challenging because tests require slicing off pieces of the plants, which can move the bacteria from the outside to the inside or vice versa. It becomes difficult to know where a pathogen might have been before the plant was cut. "The results are often imprecise because the methods allow bacteria to move," said Pruitt, a co-author of the findings. Deering used a fixative to freeze the location of the bacteria in the plant tissues before slicing samples. Antibodies labeled with fluorescent dye were used to detect the pathogens, a process called immunocytochemistry. "This shows us as close to what was in the plant when it was living as possible," Deering said. "The number of bacteria increased and persisted at a high level for at least 12 days, the length of the studies." Deering said she was able to count hundreds of bacteria in almost every type of tissue. Proper sanitization would eliminate Salmonella and E. coli from the surface of foods, but not inner tissues, Deering and Pruitt said. Cooking those foods to temperatures known to kill the pathogens would eliminate them from inner tissues. 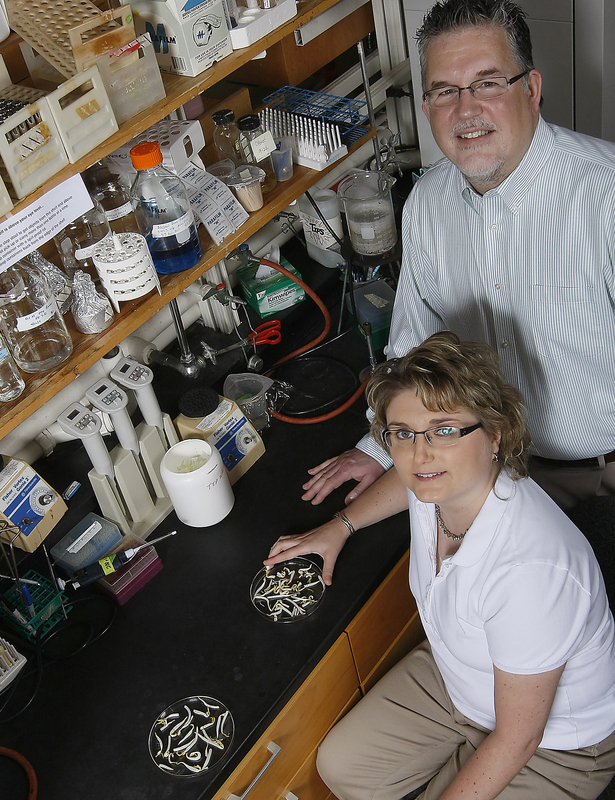 Deering and Pruitt will continue to study the pathogens to determine how they survive inside plant tissues and possible ways to eliminate them. The U.S. Department of Agriculture's Agricultural Research Service funded their work. A variety of products of plant origin, such as tomatoes, melons, peppers and peanuts, have been implicated in Salmonella spp. associated outbreaks in recent years. Although these bacteria have been found to internalize within some plants associated with foodborne-related outbreaks, the internalization in peanut plants has not been examined to date. To investigate internalization and where the bacteria localize within the plant, intact peanut seeds were contaminated with Salmonella serovar Typhimurium expressing green fluorescent protein (GFP) for 30 min. and immunocytochemical techniques were used to localize the bacterium within the stem tissue of 16-day-old peanut plants. An average of 13.6 bacteria/mm3 were localized within the sampled tissue. The bacteria were found to be associated with every major tissue (cortical, vascular, epidermal and pith) and corresponding cell type. The cortical cells located to the outside of the vascular bundles contained the majority of the Salmonella cells (72.4%). Additional growth experiments demonstrated peanut seedlings could support the reproduction of Salmonella to high levels (109 CFU/plant) after 2 days following seed contamination. Together, these results show that Salmonella Typhimurium can internalize within many different plant tissue types after a brief seed contamination event and that the bacteria are able to grow and persist within the plant. Escherichia coli O157:H7 has been associated with numerous outbreaks involving fresh produce. Previous studies have shown that bacteria can be internalized within plant tissue and that this can be a source of protection from antimicrobial chemicals and environmental conditions. However, the types of tissue and cellular locations the bacteria occupy in the plant following internalization have not been addressed. In this study, immunocytochemical techniques were used to localize internalized E. coli O157:H7 expressing green fluorescent protein in germinated mung bean (Vigna radiata) hypocotyl tissue following contamination of intact seeds. An average of 13 bacteria per mm3 were localized within the sampled tissue. The bacteria were found to be associated with every major tissue and corresponding cell type (cortex, phloem, xylem, epidermis and pith). The cortical cells located on the outside of the vascular bundles contained the majority of the internalized bacteria (61%). In addition, the bacteria were localized primarily to the spaces between the cells (apoplast) and not within the cells. Growth experiments were also performed and demonstrated that mung bean plants could support the replication of bacteria to high levels (107 CFU per plant) following seed contamination and that these levels could be sustained over a 12-day period. Therefore, E. coli O157:H7 can be internalized in many different plant tissue types after a brief seed contamination event, and the bacteria are able to grow and persist within the plant.